Banglalion is one of the top leading private telecom companies of Bangladesh. The company got huge popularity of the uninterrupted and fabulous network service across the country. It’s one of the largest 4G wireless broadband providing companies. The company uses the WiMAX technology to provide Broadband Wireless Access. It has acquired BTRC to offer a nationwide wireless solution with data services, video services and video data services. The company is consisted with strong network with divisional offices and outlets all over the country, including Dhaka, Chittagong, Rajshahi, Khulna, Barisal, Sylhet, Rangpur etc. The brand comes with many prepaid and post paid internet plans of 4G wireless services at an affordable price. Moreover, it has freelance and corporate service plans, such as video conference solutions, VPN solutions, wi-fi solutions, LAN, IP TV and data connectivity. Banglalion offers wireless devices for better accessibility, including Dongle AS1100, Dongle WIXUBB-116, Mirage, Falcon Z, IDU AWB-RG300 etc. You can recharge and pay bills through the affiliated BRAC Bank, City Bank, Islami Bank Bangladesh Limited, DBBL Nexus, Master card, Visa card, mCash etc. Currently, the Banglalion is providing the latest 4G Wireless Interoperability for Microwave Access (WiMAX) technology. This WiMAX technology is as fast as 4Mb per second making your internet access with high speed connectivity. The company is started offering LTE services since middle of 2016. Its uninterrupted broadband connection with 4G LTE network is faster than any other service providers in Bangladesh. The company was founded on the Nov. 5, 2008, under the company act of 1994 as Banglalion Communications Limited. It’s established in Gulshan, Dhaka as its head office. ✪ Customer Care Number of Banglalion: 09611-556677. ✪ Customer Support Number of Banglalion: 16313. ✪ Corporate Service Helpline Number of Banglalion: 01811-454059. ✪ Corporate Contact Number of Banglalion: 01847-090377. ✪ Contact Numbers of Banglalion - Administrative: +880-2-58816072, +880-2-58816349. ✪ Helpline Number of Banglalion - Corporate Issue: +880-2-58816391. ✪ Fax Number of Banglalion - Administrative: +880-2-58811067. 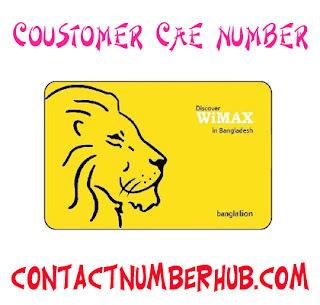 ✪ Helpline Number of Banglalion WiMAX: 09611-556677. Dhanmondi CCC: Mohammadia Super Market (Shop no: 115-116 (2nd Floor), 4 Tallabag (Sobhanbag), Mirpur Road, Dhanmondi, Dhaka-1205 (Tuesday Close). Gulshan CCC: Jabbar Tower (2nd Floor), 42 Gulshan Avenue, Gulshan Circle-1, Dhaka-1212 (Sunday closed). Mirpur CCC: 152 Begum Rokeya Soroni, Senpara, Mirpur-10, Dhaka-1216 (north of the Al-helal Hospital) (Friday closed). (opposite Of Baitul Mukarram Masjid) (Friday closed). Uttara CCC: Nogor Bonolota, House-24, Flat-a1, Sonargaow Jonopath, Sector-11, Uttara, Dhaka-1230 (Friday closed). Old Dhaka CCC: Nagar Siddiqui Plaza (1st Floor), 3/7, 3/7-1 Johnson Road, Dhaka-1100 (opposite Of Jagannath Road) (Friday closed). Jatrabari CCC: 95, Shahid Faruq Road, South Jatrabari circle, 1st Floor, Dhaka.